Batch DOC and DOCX Converter Doc to Docx and Docx to Doc Batch Converter. 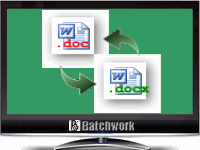 Docx to Doc and Doc to Docx Batch Converter convert Word 2003 to/from Word 2007. Batch DOC AND DOCX Converter supports an efficient Multi-Thread conversion engine. So you could control the conversion action very easily. You can stop or pause and continue it in any time. Batch DOCX To DOC Converter provides an impressively simple way to convert Word files. Its setup ensures that users of all skill level will find success. At first, we needed to visit the program's Help file, as its interface was almost too basic. Its layout has very few command icons and, after reading the help file, it only took a few minutes to master. We quickly grew to appreciate the program's lack of diversions and have confidence that users of any skill level would feel equally comfortable. Batch DOCX To DOC Converter allowed us to choose single files, multiple files, or entire folders with equal ease by surfing through its file tree. All our chosen files were listed with their file location and type on the main screen. Our .doc files were then quickly converted to the newer .docx format and vice versa. We were pleased to find the files appeared in the appropriate destination with all their data intact. The program's best feature was its search engine, which helped track down files the locations of which we didn't know exactly. Overall, this amazingly simple program provided a precise function and did it very well. Batch DOCX To DOC Converter has a 7-day trial. While we were initially concerned about its interface, this simple program won us over and we recommend it.